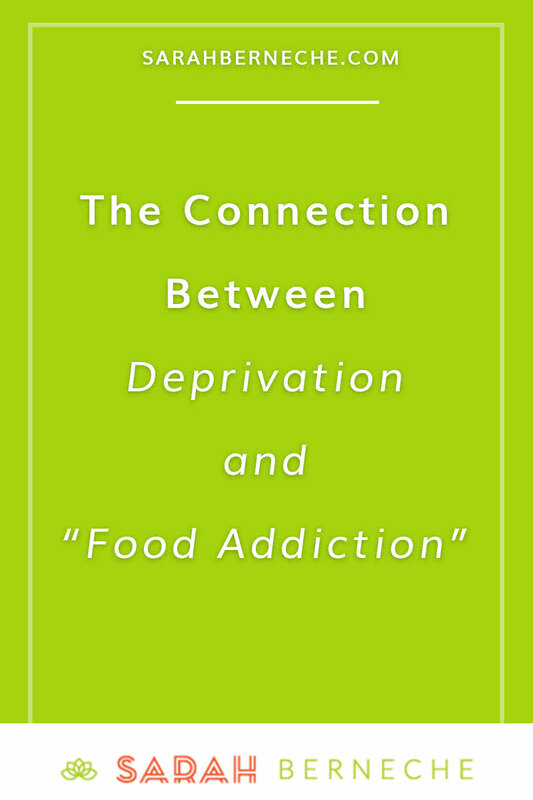 Are you "addicted" to food or just deprived? While we can “feel” addicted to foods, clinical food addiction just isn’t a thing at this time. Even MSG-laden Chinese take-out, loaded ketchup chips, or Haribo tangfastics (my personal favourite…please send). Of course we love these foods, but it is very natural to eat and enjoy delicious foods — not pathological. In contrast, diet culture and its symptoms, like weight suppression, food restriction, over-exercise, and so on, are pathological and have well-studied psychological and physiological consequences. Adhering to diet culture feels good because being thin or performing thinness upholds the status quo. Because thinness is idealized, being thin or doing “thin things” — like hitting the gym, drinking green smoothies, or "working on our gut health” — helps us to feel superior. Except dieting requires restriction by its very definition — either physiological or psychological — and scarcity leads us to feel “addicted” to food. Allowing ourselves to fully enjoy and savour food feels foreign and wrong because we’re rebelling against the very system trying to keep us in our place. But by denying diet culture and working toward food freedom, you offer yourself the opportunity to move away from food and body preoccupation. #1. ABSENCE OF “OVERT” PERMISSION. Overt permission is superficial and involves three main points: a) eating what you want, b) when you want, c) in the quantity you want. You may feel that if you “allow” yourself to eat cookies whenever you want that you will never choose another snack, or if you let yourself just have the lasagna or macaroni and cheese you’ll never choose anything other than pasta. But habituation theory suggests otherwise: eventually, you’ll tire of these foods (yes, even of your favourite foods!) and opt for something else. Humans are hard-wired for variety, so even if it seems this way, it’s because you’ve been living within a restrictive framework — not because these foods are inherently addictive. Remember that bingeing, overeating, and other “problematic” behaviours are reactions to restriction, not to permission. #2. ABSENCE OF “AUTHENTIC” PERMISSION. Authentic (and unconditional) permission goes deeper. In my experience, it also takes more practice and time to grasp and implement. Let’s say you’re eating what you want, when you want, and in the amount you desire. Yet you’re still bingeing or generally feel out of control around and obsessed with food. Let’s talk about how you’re eating and what you’re thinking. Many people who believe they are practicing unconditional permission are actually self-sabotaging. Eating in secret — hiding food, only eating certain foods when you’re alone, hiding wrappers or containers — is a subtle form of restriction. And even though intellectually you may know you are allowed to eat what you want, it takes time for our emotions to catch up. This may explain why you still feel guilt and/or shame when eating certain foods, for you believe you should not be eating them. With time and practice (and help from me, if you like!) you can begin to integrate the lessons and eat without shame or guilt. Let me know in the comments: do you engage in overt or subtle forms of restriction? I’m Doing This Intuitive Eating Thing — So Why Do I Keep Overeating?